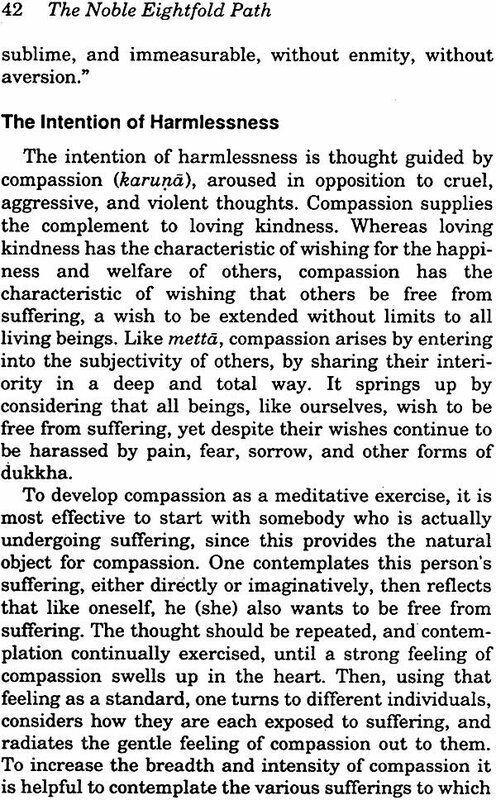 The essence of the Buddha’s teaching can be summed up in two principle: the Four Noble Truths and the Noble Eightfold Path. 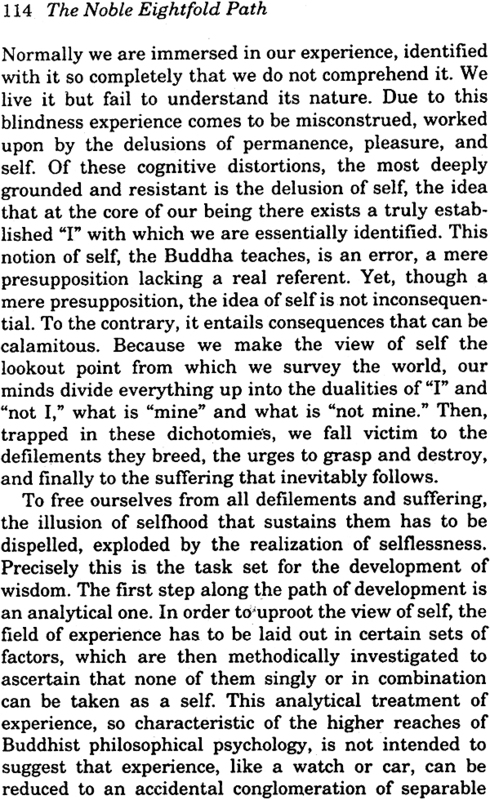 The first covers the side of doctrine, and the primary response it elicits is understanding; the second covers the side of discipline, in the broadest sense of that word, and the primary response it calls for is practice. In the structure of the teaching these two principles lock together into an indivisible unity called the dhamma-vinaya, the doctrine – and- discipline, or, in brief, the Dhamma. The internal unity of the Dhamma is guaranteed by the fact that the last of the Four Noble Truths, the truth of the way, is the Noble Eightfold Path, while the first factor of the Noble Eightfold Path, right view, is the understanding of the Four Noble Truths. Thus the two principles penetrate and include one another, the formula of the Four Noble Truths containing the Eightfold Path and the Noble Eightfold Path containing the Four Truths. Given this integral unity, it would be pointless to pose the question which of the two aspects of the Dhamma has greater value, the doctrine or the path. But if we did risk the pointless by asking that question, the answer would have to be the path. The path claims primacy because it is precisely this that brings the teaching of life. 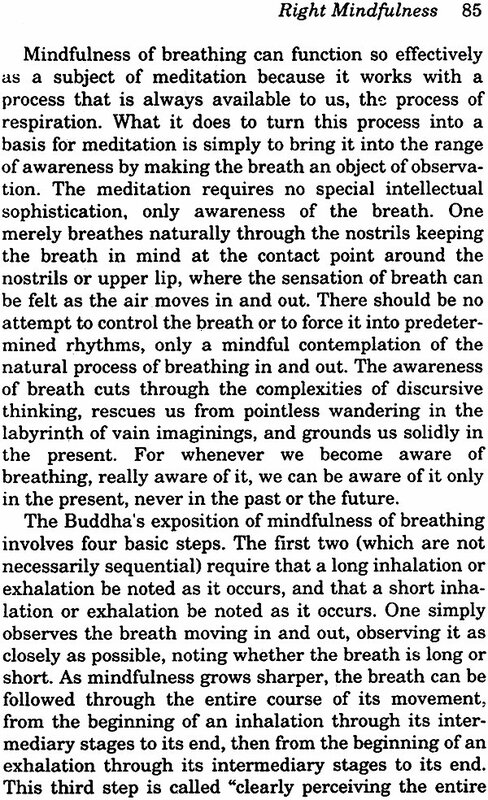 The path translates the Dhamma from a collection of abstract formulas into a continually unfolding disclosure of truth. It gives an outlet from the problem of suffering with which the teaching starts. And it makes the teaching’s goal, liberation from suffering, accessible to us in our own experience, where alone it takes on authentic meaning. 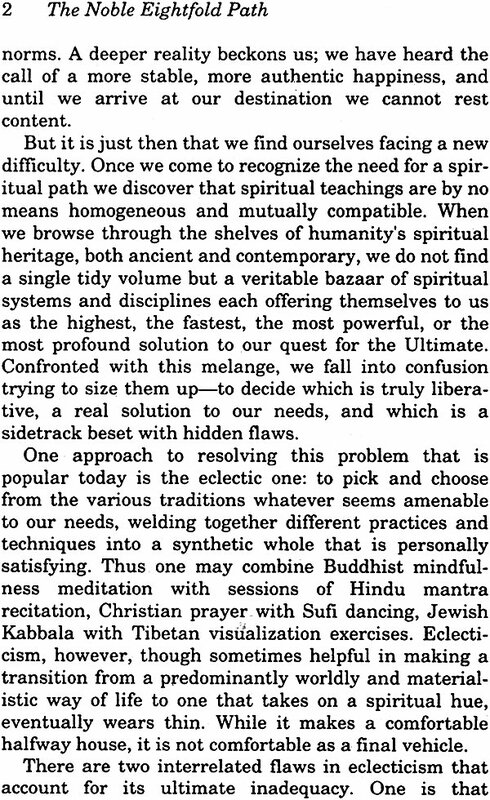 To follow the Noble Eightfold Path is a matter of practice rather than intellectual knowledge, but to apply the path correctly it has to be properly understood. In fact, right understanding of the path is itself a part of the practice. It is a facet or right view, the first path factor, the forerunner and guide for the rest of the path. 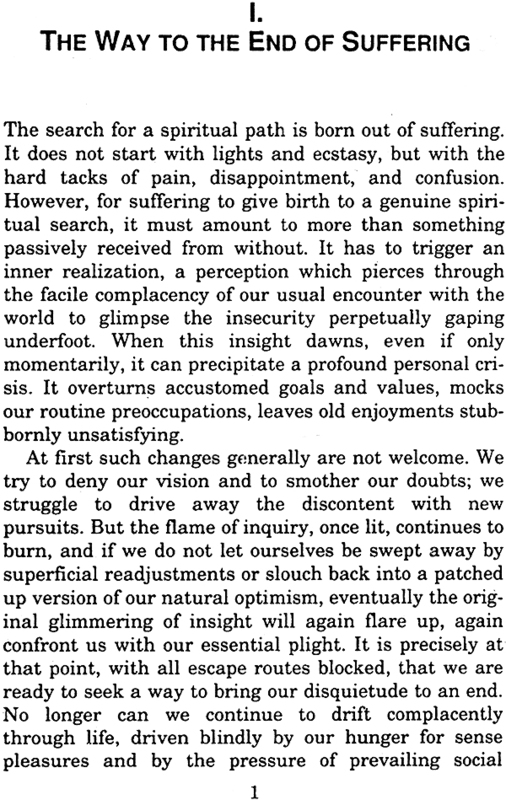 Thus, though initial enthusiasm might suggest that the task of intellectual comprehensive may be shelved as a bothersome distraction, mature consideration reveals it to be quite essential to ultimate success in the practice. The present book aims at contributing towards a proper understanding of the Noble Eightfold Path by investigating its eight factors and their components to determine exactly what they involve. 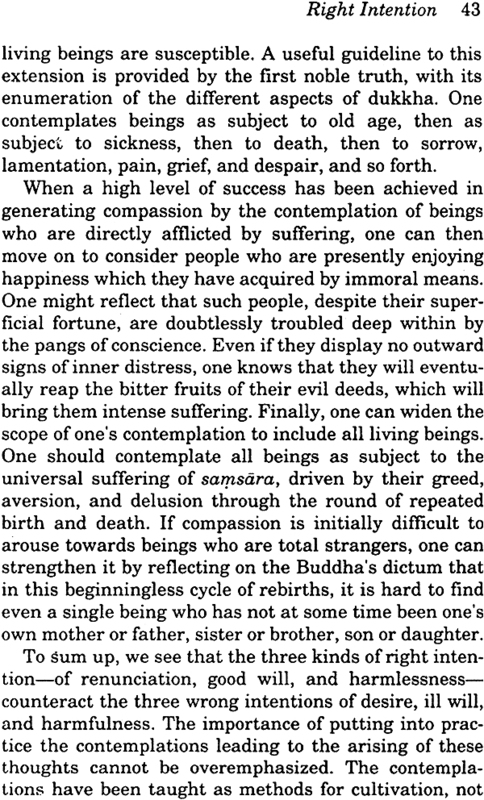 I have attempted to be concise, using as the framework for exposition the Buddha’s own words in explanation of the path factors, as found in the Sutta Pitaka of the Pali Canon. 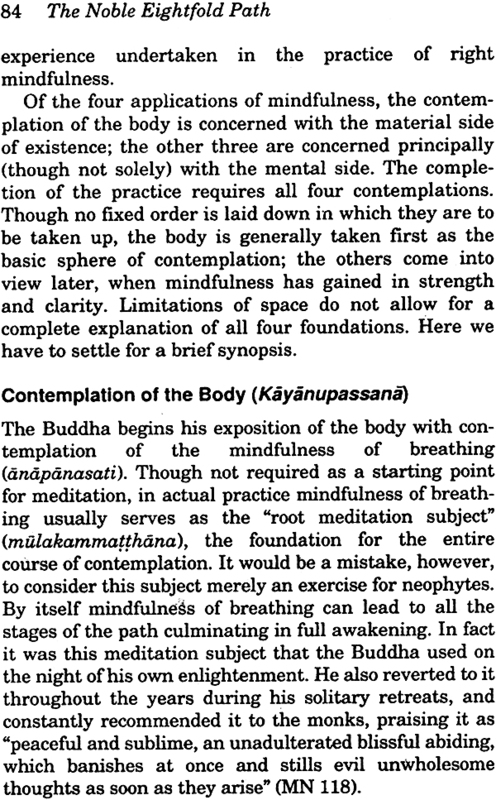 To assist the translation, I have tried to confine my selection of quotations as much as possible (but not completely) to those found in Venerable Nyanatiloka’s classic anthology, The Word of the Buddha. In some cases passages taken from that work have been slightly modified, to accord with my own preferred renderings. 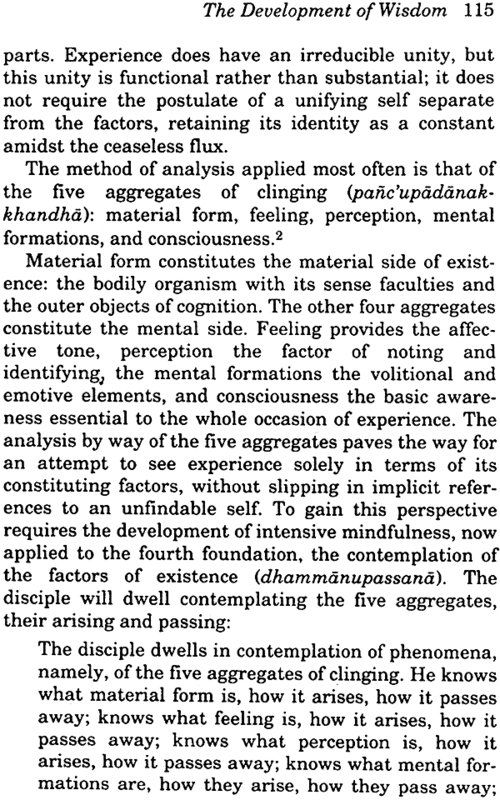 For further amplification of meaning I have sometimes drawn upon the commentaries; especially in my accounts of concentration and wisdom (Chapter VII and VIII) I have relied heavily on the Visuddhimagga(The Path of Purification), a vast encyclopedic work which systematizes the practice of the path in a detailed and comprehensive manner. Limitations of space prevent an exhaustive treatment of each factor. To compensate for this deficiency I have included a list of recommended readings at the end, which the reader may consult for more detailed explanations of individual path factors. For full commitment to the practice of the path, however, especially in its advanced stages of concentration and insight, it will be extremely helpful to have contact with a properly qualified teacher.